The term “blockchain,” may be synonymous with Bitcoin, but many uses for blockchain technologies are being pioneered that are unrelated to currency. Companies from IBM to Facebook are well-known for investing in blockchain technology research and many organizations are using blockchain in new, and interesting ways. Blockchain is a new type of database, which incorporates cryptography to achieve one primary goal: a secure, tamper-proof ledger of records and data of any type. The problem blockchain technology solves is multi-layered. At the core of it, blockchain simply allows for the recording of data, much like any other database. However, it is, for the most part, tamper-proof and much more reliable than conventional systems, because it does not have a single point of access, nor is it centrally administered. Developments and enhancements with blockchain have given rise to new projects, such as the ability to launch small applications on top of the blockchain layer, as is the case with Ethereum, which allows for smaller dapps (decentralized applications) to be developed and run on the main network, or having extra security and privacy features around transactions, as in Monero, where senders and receivers have their identities protected to a larger extent when compared with Bitcoin. Companies such as Goldman Sachs, Barclays, and J.P Morgan are exploring and testing ways to use blockchain in investment banking. 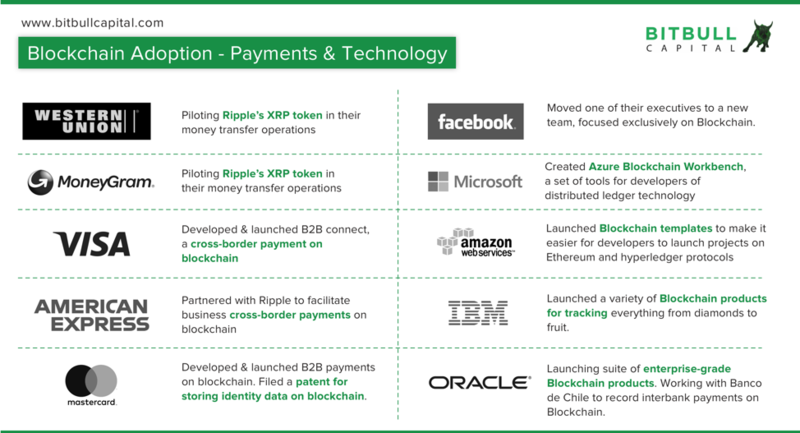 Other large companies, shown in the chart below, are using blockchain technology to ensure privacy and safety for consumers. Some other industries and use cases for blockchain are outlined below. Given the tamper-proof and secure nature of blockchain-based ledgers, they make a strong case for identity and personal data record-keeping on a governmental or, even global scale. While a lot of development and testing needs to be done on the security front, there are projects already working in this space, such as CIVIC and THEKEY, which aim to become central identity verification service providers, protecting consumer data and facilitating secure information accessibility. Given how blockchain networks can be run by independent nodes across the globe, frameworks for distributed services are easy to set up. For instance, instead of a central server fending off DDOS (Distributed Denial of Service) attacks, a blockchain-based service can leverage a global node of computers to distribute the defense. Similarly, there is a lot of potential for blockchain based content delivery networks, which can create peer-to-peer connections for sharing video and web content at faster speeds without the need for considerable bandwidth. Both healthcare services and insurance depend heavily on personal information, prior history and records, all of which can be reliably accessed from a blockchain, instantaneously and within a permission-based structure. Additionally, new developments are making blockchains more compatible with each other, allowing data from one project to be accessed by another (for instance, your medical records to be accessed by your insurance provider) completely securely, without any actual data transfer since you ultimately control all of your data. Tokenization is the conversion of assets into digital tokens. For example, in November 2018, a $30M real estate property in Manhattan was tokenized. Since blockchain-based projects can support tokenization (converting assets into digital tokens) and smart contracts (such as Ethereum), there exist opportunities to tokenize tangible and intangible assets, including real estate and securities. Once again, given the tamper-proof, universally accessible and secure nature of blockchain-based ledgers, they fit quite naturally into such models. Currently, however, there are regulatory hurdles, particularly surrounding the buying, selling, and trading of securities, and progress in this sphere is expected in 2019, which will open doors for projects to tap new global markets to raise funds and issue securities. Some notable ventures in this space include Polymath and Swarm. Nearly 3 billion people are unbanked or underbanked, resulting in lack of financial control. There are several reasons behind this; the major ones are lack of development or access to financial services. Not only are these people largely outside the mainstream economy, but they are also unable to access several basic services. Cryptocurrencies and blockchain technology offer a way to bank the unbanked, by allowing them to avail blockchain-powered financial services globally without the need for any middlemen. While there are certain governments where cryptocurrencies are banned, the use of blockchain technology is still viable. Blockchain technology is also a natural fit for fraud prevention and increased transparency in governmental processes. Recording voting data on the blockchain is one example, which is under trial in the Ukraine, and applications for fraud prevention are also being explored in other countries. Cryptocurrencies such as Bitcoin and Ethereum represent only a fraction of the opportunities created by blockchain technology. As the world becomes more connected and access to the internet and mobile services increases, we are bound to see blockchain technology being applied in many areas of life and business. Joe DiPasquale is CEO of BitBull Capital and frequently presents to TIGER 21 Groups. He has been a cryptocurrency investor since 2013.Joe DiPasquale is CEO of BitBull Capital and frequently presents to TIGER 21 Groups. He has been a cryptocurrency investor since 2013.